This article reported exploratory removal foreign body in the form of a piece of broken glass embedded in the subcutaneous tissues of the right temporal region of a 10-year-old boy who had accidental fall on a glass slab about 12 weeks earlier without imaging technique. The presenting complaint was pain and swelling adjacent to a healed scar (point of entry of the foreign body). 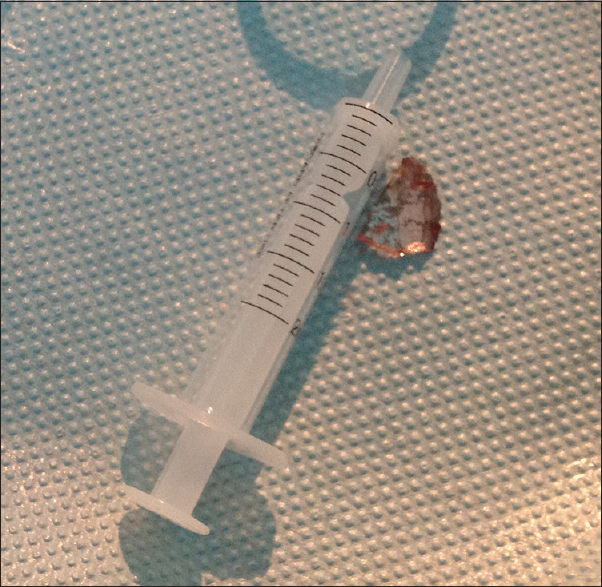 Exploration was done out under local anesthesia, and a 2.0 cm by 1.0 cm piece of broken glass was removed. The postoperative period was uneventful. Complications from accidental foreign bodies can be minimized by a more thorough examination of resultant wounds. Proper accidental wound cleansing in children to remove all foreign bodies by parents or doctors at home or the hospital, respectively, is necessary to prevent retention of foreign bodies and their consequent complications. Foreign bodies are frequently introduced into the tissues of the head and neck region mainly as a result of injuries or operations. Rudagi et al. cited trauma to the maxillofacial region from road traffic accidents as one of the major causes of foreign body embedment. 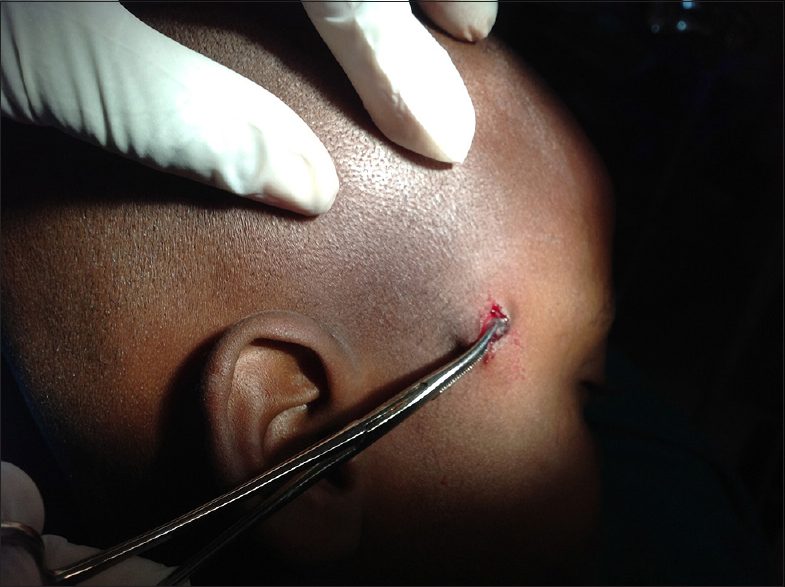 Traumatic foreign body impaction in the head and neck region as a result of injury is prevalent in children because pediatric facial injuries essentially that of soft tissue are common due to a high level of physical activity, decreased supervision, and tendency toward risk-taking behavior among children, especially in the developing countries. These injuries commonly heal uneventfully with adequate first-aid treatment given either at home or in the hospital. The absence of proper first-aid treatment may result in complications which may include foreign body impaction with consequent complications. These foreign bodies encountered in the oral and maxillofacial region present a diagnostic and treatment challenge even to an experienced surgeon due to many factors such as the size and nature of the object, access difficulty, and anatomical proximity to vital structures., A proper initial treatment performed by a multidisciplinary team usually increases the survival of a patient with maxillofacial foreign body injuries. However, some foreign bodies are missed during the initial patient encounter with as much as one-third of them. Retained foreign bodies missed at initial evaluation may be discovered as incidental findings, while others may become symptomatic by causing inflammation, delayed wound healing, pus discharge, formation of granulation tissues, toxicity, or even become painful and swollen thereby prompt care-seeking behavior. Other presentations may include fascial space infections, pigmentation, allergic reactions, persistent draining sinus, and other distressing symptoms. The severity of these complications varies widely depending on the size, nature, and location of the foreign body within the tissues and the nature of wound, especially dirty wounds. Migration of foreign body may occur within the tissues after a certain period which consequently transforming it from asymptomatic state to a symptomatic state. Plain radiographs are the initial screening modality for a suspected foreign body as most metal and glass foreign bodies are detectable on radiographs. When a suspected superficial foreign body is not delineated on radiographs, ultrasonography is the next modality of choice because it is useful in detecting radiolucent foreign bodies such as wood. CT is usually reserved for deep foreign bodies or when foreign bodies are not seen on radiographs or ultrasonography but are suspected. Surface markers, multiple-projection radiographs, wire grids, fluoroscopy, or stereotaxic devices may also help to locate exact position of an object buried in soft tissue. The highlighted standards may sometimes become difficult in low-resource-constrained economy where income earning power and standard of living are low. The presence of superficial foreign body may be approached blindly without radiography by an exploratory incision. The objective of the report was to describe the removal of glass foreign body in the temporal region of a 10-year-old boy by relying sole on the patient history. 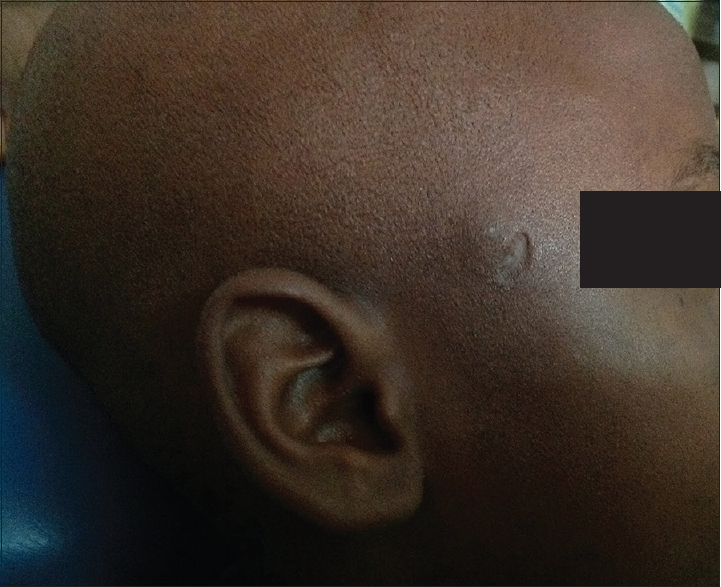 A 10-year-old boy presented with a complaint of pain and swelling around a healed scar at the right temporal region of 3-week duration. The history revealed that the patient accidentally fell on a glass slab about 12 weeks before the presentation, and the glass shattered with an injury to the temporal region of the face. The resulting wound on the face was treated with local antiseptics at home and it healed with a scar [Figure 1]. Nine weeks later, pain developed around the scar region. The pain was initially mild, intermittent but became severe, especially on touching the scar. Swelling developed gradually with the increasing intensity of pain. There was no positive history of the chronic medical condition, and parental income earning categorization was into low socioeconomic status. Examination revealed an apparently healthy child with 2.0 cm by 0.8 cm oblique scar at the right temporal region midway between the right lateral canthus and pinna of the ear. There was associated oval swelling lateral to the superior end of the scar, and the surrounding skin was devoid of ulceration. Light palpation of the swelling elicited a sharp response from the patient and a firm, discrete substance underneath. From the history, presenting complaint and examination, a diagnosis of foreign body was made. The patient was prepared for exploration under local anesthesia. A 2.2-cm incision was made over the swelling, and dissection was done carefully to underlying tissues which were essentially fibrous in nature. Further dissection exposed a shiny foreign body which was embedded within the subcutaneous tissues but superficial to the temporalis muscle [Figure 2]. When fully exposed, it showed a piece of glass substance [Figure 3]. Following the removal of the 2 cm by 1 cm piece of glass [Figure 4], the operation site had multiple pieces of glass which necessitated thorough cleaning with normal saline to remove residual pieces of glass. With a clean postoperative wound [Figure 5], suturing was done in layers. The patient was placed on analgesics and antibiotics before discharge. On recall, healing was satisfactory and uneventful. The age of the affected patients collaborates the fact that foreign bodies in the head and neck region are more prevalent in children because their proneness to facial injuries from physical activity, decreased supervision, and risk-taking behavior which this case was a fall on the glass. Some foreign bodies may be discovered as incidental findings while others may become symptomatic forming granulation tissues, discharging sinuses, or even become painful and swollen. Migration of foreign body may occur within the tissues after a certain period which consequently transforming it from asymptomatic state to a symptomatic state. Affected patients usually seek attention when the retained foreign body becomes symptomatic. 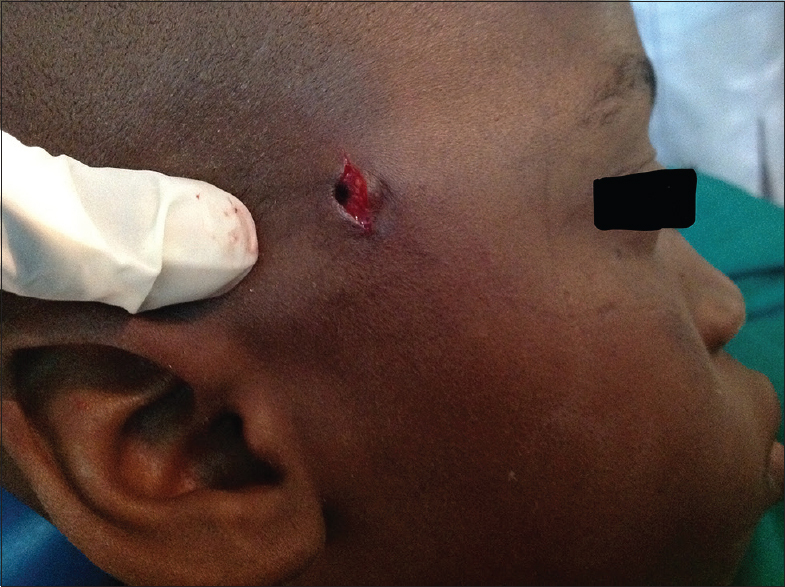 This is typical of the case presented here in which the piece of broken glass penetrated into the temporal region and remained asymptomatic for 9 weeks. The presence of glass foreign body in the facial region is expected to elicit immediate symptoms, especially when they are superficially located. A similar case of foreign bodies in the preauricular region led to the limitation of mouth opening. The initial absence of symptoms for this case could be that the glass was initially embedded in deeper tissues. With the gradual migration to the surface, it elicited the pain with gradual swelling. History and clinical examination are adequate in detecting and locating superficial foreign bodies but when in doubt, radiographies, ultrasonographies, computed tomography, magnetic resonance, ultrasonography, or CT are recommended., The exploratory surgery was embarked on by the dental surgeon based on the superficial and easy location of the foreign object on palpation tied with a history of fall on glass and inability of the patient to afford the cheapest available imaging technique in the form of the plain radiograph. The presence of glass foreign bodies in the facial region resulting from a road traffic accident is an expected phenomenon due to the surrounding objects at the time of the incident. However, such foreign body on the facial region resulting from a fall is not common. Even then, the wound could easily be examined and any superficial foreign object identified and removed in a health-care setting before the wound heals. The case presented here was not taken for medical attention after the incidence and hence the retention of the piece of glass. This resulting complication could be added to the absence of proper first-aid treatment in the form of self-medication which is still a common practice in our environment. This was a case of glass foreign body in the temporal region following an accidental fall. Symptoms were essentially similar to that seen with many foreign bodies, and these subsided following the removal. Proper accidental wound cleansing in children to remove all foreign bodies by parents or doctors at home or the hospital, respectively, is necessary to prevent retention of foreign bodies and their consequent complications. Santos Tde S, Melo AR, de Moraes HH, Avelar RL, Becker OE, Haas OL Jr., et al. Impacted foreign bodies in the maxillofacial region-diagnosis and treatment. J Craniofac Surg 2011;22:1404-8. Rudagi BM, Halli R, Kini Y, Kharkhar V, Saluja H. Foreign bodies in facial trauma-report of 3 cases. J Maxillofac Oral Surg 2013;12:210-3. Hogg NJ, Horswell BB. Soft tissue pediatric facial trauma: A review. J Can Dent Assoc 2006;72:549-52. Holmes PJ, Miller JR, Gutta R, Louis PJ. Intraoperative imaging techniques: A guide to retrieval of foreign bodies. Oral Surg Oral Med Oral Pathol Oral Radiol Endod 2005;100:614-8. Halaas GW. Management of foreign bodies in the skin. Am Fam Physician 2007;76:683-8. Lammers RL. Soft tissue foreign bodies. Ann Emerg Med 1988;17:1336-47. Mohanavalli S, David JJ, Gnanam A. Rare foreign bodies in oro-facial regions. Indian J Dent Res 2011;22:713-5. Woolley AL, Wimberly LT, Royal SA. 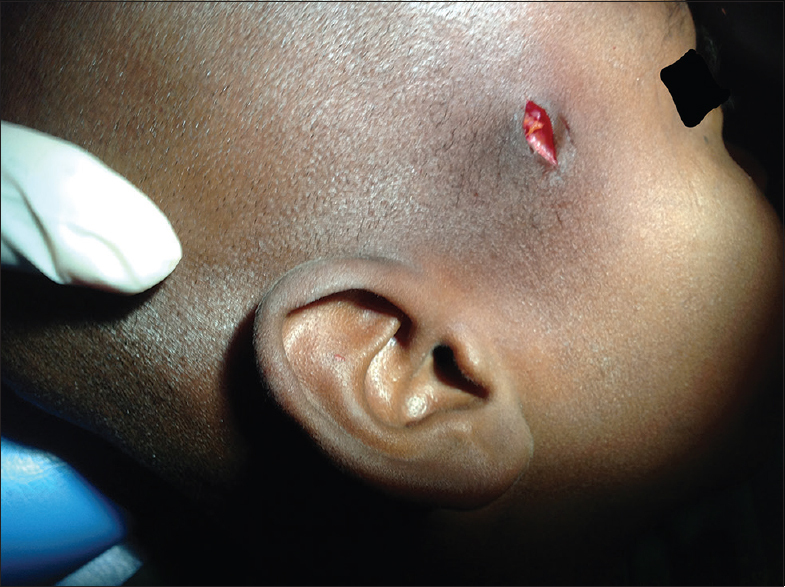 Retained wooden foreign body in a child's parotid gland: A case report. Ear Nose Throat J 1998;77:140-3. Agarwal S, Jagade MV, Mishra A, Joshi S. Foreign body in temporomandibular joint region. Otolaryngology 2013;3:137. Paoli JR, Dekeister C. A tooth in the orbit. Br J Oral Maxillofac Surg 2001;39:327. Figueira EC, Francis IC, Wilcsek GA. Intraorbital glass foreign body missed on CT imaging. Ophthalmic Plast Reconstr Surg 2007;23:80-2. Menakar VS, Chavan A. Retained metallic foreign body in Cheek: A diagnostic and surgical challenge. Int J Head Neck Surg 2013;4:107-9. Shehata E, Moussa K, Al-Gorashi A. A foreign body in the floor of the mouth. Saudi Dent J 2010;22:141-3. Krimmel M, Cornelius CP, Stojadinovic S, Hoffmann J, Reinert S. Wooden foreign bodies in facial injury: A radiological pitfall. Int J Oral Maxillofac Surg 2001;30:445-7. Javadrashid R, Fouladi DF, Golamian M, Hajalioghli P, Daghighi MH, Shahmorady Z, et al. Visibility of different foreign bodies in the maxillofacial region using plain radiography, CT, MRI and ultrasonography: An in vitro study. Dentomaxillofac Radiol 2015;44:20140229. Flom LL, Ellis GL. Radiologic evaluation of foreign bodies. Emerg Med Clin North Am 1992;10:163-77. Jardim EC, dos Santos PL, Guskuma MH, Filho OM, Garcia IR Jr., Ponzoni D, et al. Foreign body in preauricular region. J Craniofac Surg 2011;22:1531-3. Oikarinen KS, Nieminen TM, Mäkäräinen H, Pyhtinen J. Visibility of foreign bodies in soft tissue in plain radiographs, computed tomography, magnetic resonance imaging, and ultrasound. An in vitro study. Int J Oral Maxillofac Surg 1993;22:119-24. Narita N, Yamada T, Imoto Y, Ogi K, Sakashita M, Ito Y, et al. Treatment of scattered glass foreign bodies in both the superficial and deep neck: A case report. Auris Nasus Laryn×2005;32:295-9.